How Can I Customize The Branding On My Quiz? You may want to update the preloaded LeadQuizzes logo with your own logo and you can easily do that! To update the logo on your quiz follow the below steps. 1. Click on the gear symbol in the top right hand corner and click "Profile Settings"
2. On this page, you will be able to add a custom logo to your quiz by clicking, Upload Your Logo. Make sure your image is smaller than 500 x 150. If you don't want a logo on your quiz, you can upload a white image. 3. 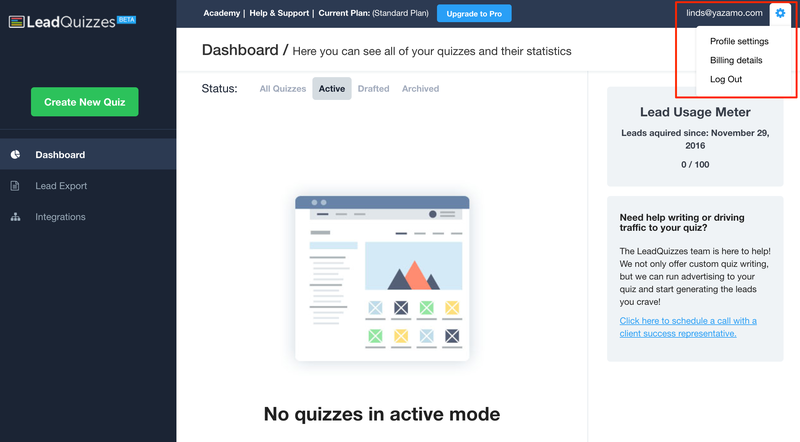 You can remove the "Powered by LeadQuizzes" text on the bottom right of the quiz, if you have a premium account. Just change the Disable LeadQuizzes Branding switch to 'Yes' by clicking on it.